Looking for a new TV that will satisfy all your multimedia viewing demands and at the same time provide you with a responsive and immersive console gaming experience? We’ve put together this buyer’s guide in order to narrow down your choices according to your budget as well as to point out everything you need to know before buying a new TV for console gaming. These are the best 4K HDR TVs for gaming in 2019 which will also undoubtedly hold up well in 2020. Based on numerous tests, reviews, and through research, we find these to be the best 4K gaming TVs. As long as you stick with our guidelines, we guarantee that you will be satisfied with the display you pick for the money you’ve paid as all TVs in this list offer the best value/money in their respective category. For the most responsive console gaming experience, be sure to check out our best monitor for PS4 Pro and Xbox One X guide as well as best monitors for PS4 and Xbox One. Not sure if you should get a monitor or a 4K TV for console gaming? 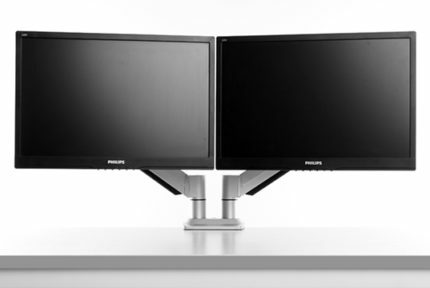 Learn more about the difference between monitors and TVs for gaming. 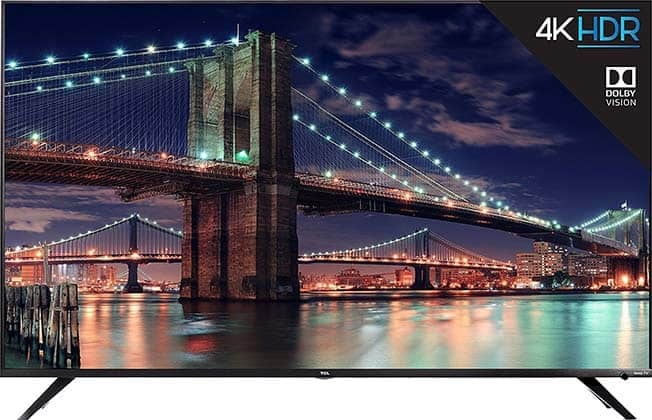 If you want the cheapest 4K TV that’s any good, we recommend none other than the TCL S425 series which offer an unbeatable value for the price. If it’s too expensive for you now, we highly advise you to save up for it; otherwise, you may check for some cheaper TVs in our best TV for gaming on PS4 and Xbox One buyer’s guide. 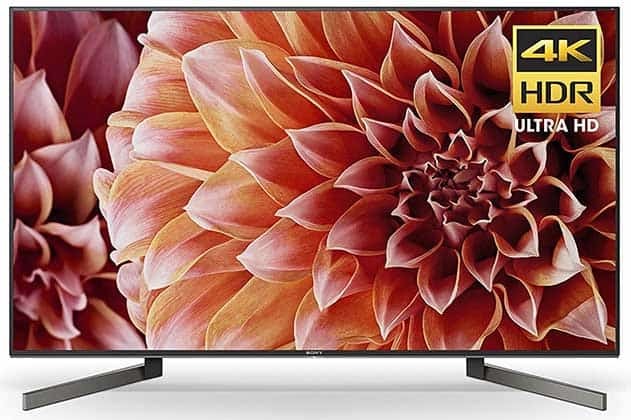 Note that the TCL S425 series (2019) consists of upgraded TV models from the popular S405 series (2017/2018). 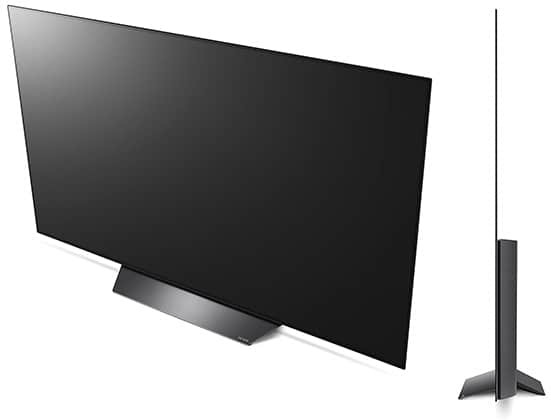 Apart from the design, the S425 and S405 TVs are identical. So, pick according to your design preference or whichever is cheaper. The S425 TVs will gradually replace the S405 models. The best TV for 4K gaming on a budget is undoubtedly the TCL 55S425/S405. Both the 2017 and 2019 model have been Amazon’s best-selling TVs for quite a while, and there’s a good reason behind it. 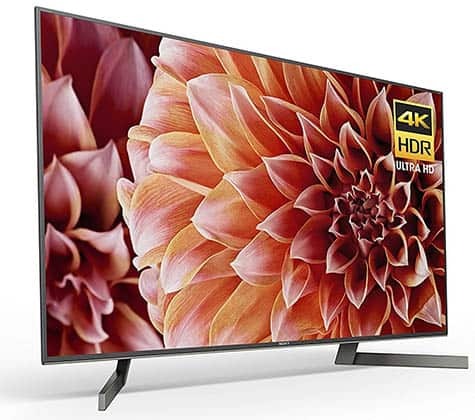 For just around $400, you can get a 55-inch TV with 4K Ultra HD resolution, entry-level HDR, and most importantly for gamers, low input lag and a quick response time speed. The picture quality is also unbeatable at this price point. Thanks to its high-quality VA panel with a 4,000:1 static contrast ratio, the TV delivers distinctive black shades. Moreover, 10-bit color depth (8-bit + FRC) makes for 1.07 billion of colors which along with 4K resolution ensure vibrant and crisp picture quality for an immersive viewing experience. The colors are decent out of the box, but for the optimal image quality, calibration is required which can take up to an hour and you’re done for good. Alas, the main downside of the panel is its rather low peak luminance of only 200-nits which will result in some lack of details in the highlights. What’s more, due to the semi-glossy screen coating, you will have to dim the lights in well-lit rooms, as the screen is quite reflective. Finally, due to the only standard sRGB color gamut, low peak brightness, and no local dimming, HDR performance is underwhelming; but at this price, nothing more is expected. The TCL 55S405/S425 is the lowest input lag TV for gaming at 4K/60Hz in this list. With only 15ms of input lag, the TV is even fit for professional and competitive gameplay, though a monitor would still be a better choice if you want the absolute best performance.. In addition, the response time speed of 14ms will eliminate most of the ghosting of fast-moving objects in video games and movies. However, in darker scenes, where black and gray pixels dominate, there will be dark smearing and motion blur noticeable. The amount of ghosting and motion blur certainly isn’t game-breaking and is, in fact, tolerable and expected from a VA panel display. Lastly, the viewing angles are not as good as they are on IPS and OLED panels, so if you are looking at the TV from the sides, there will be shifts in contrast – which is also an expected drawback of the VA panel. The TCL 55S425 4K TV is based on Roku TV OS which offers a surprisingly smooth navigation through the smart features with a user-friendly menu. Furthermore, in ‘PC mode’, the TV supports 4:4:4 chroma subsampling allowing you to use it as a monitor for PC without fuzzy and blurry text on colored backgrounds. Note that all TVs in this list support 4:4:4 chroma which makes them viable for PC gaming. The TV has an effective refresh rate of 120Hz meaning that its processor inserts artificial frames between the regular frames in order to deliver a smoother picture for fast-moving content. This effect is also referred to as ‘motion smoothing’ or ‘the soap opera effect‘. Unfortunately, this technology cannot be adjusted nor turned on/off – but it’s not particularly noticeable either. Note that the TV uses PWM (Pulse-Width Modulation) method to regular brightness, so it’s not flicker-free. However, it flickers at 120Hz, so it’s not noticeable and it also helps with the motion blur handling. 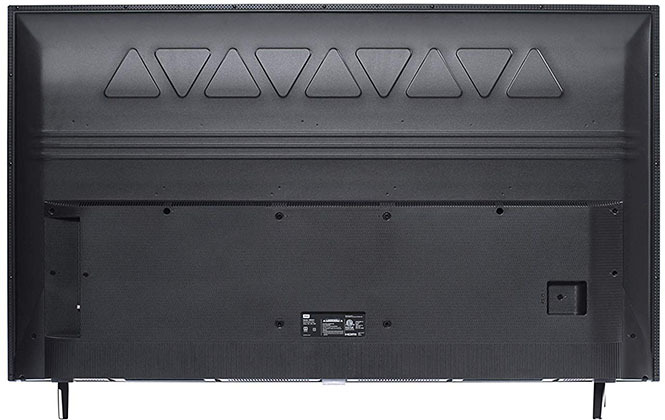 The design of the TCL 55S425 is nothing spectacular, but the build quality is solid and it can be VESA mounted using the 200 x 200mm pattern. Connectivity consists of three HDMI (one with ARC, all three with HDCP 2.2) ports, a USB port, both analog and digital audio jacks, composite-in, a tuner, and Ethernet as well as two 8W DD+ built-in speakers and WiFi. If you want the best 4K TV for gaming under $400-$500, the TCL 55S425 is the best choice by far. In case you want the best 4K HDR TV for gaming under 1000 USD, we have two great TVs for you in the $500-$1,000 range. If you want to spend more than $500 on a TV but less than $1,000, and get the absolute best value/price you can, the TCL 55R617 is for you. In short, the TCL R617 series TVs provide a picture quality and performance that’s worth much more and in some aspects, they are unmatched even by some $1,000+ TVs. With a peak brightness of 1,200-nits, a wide 90% DCI-P3 color gamut, and a contrast ratio of 6,000:1 through full-array local dimming (FALD), the TCL 55R617 will blow you away with its picture quality, especially for HDR content. Such high brightness and contrast allow for incredibly vivid details in highlights and shadows of the image while the rich colors make the picture more life-like. The TV also supports both HDR10 and Dolby Vision HDR formats allowing you to enjoy a variety of compatible content in all its glory. In the Game Mode, the TCL 55R617 input lag amounts to 17ms which is a bit higher than the S425 series, but still more than good enough for a responsive gameplay without any noticeable delay whatsoever. Furthermore, its response time speed of 12ms further eliminates motion blur, but since it’s a VA panel after all – some minor issues with ghosting on dark backgrounds are present; the same goes for the viewing angles. The backlight of the TCL 55R617 4K HDR TV flickers at 480Hz which makes flickering unnoticeable and makes the picture less blurry with moving objects. In the settings menu, you will find the ‘Action Smoothing’ feature which interpolates frames for smoother fast-paced video, however, with this model, you can also enable/disable it and adjust its sensitivity. Additionally, there’s the ‘LED Motion Clarity’ feature that via backlight strobing or black frame insertion (BFI) further reduces the perceived motion blur and ghosting. 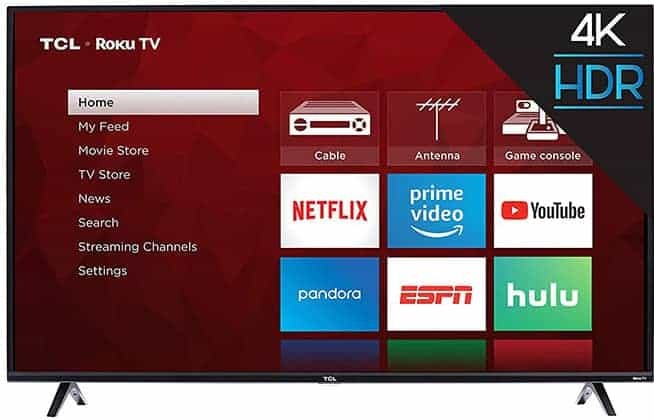 This TCL TV also features Roku TV OS. The design is much better than that of the S425 series. The R617 has much thinner bezels and a better build quality though the TV is still a bit bulky. Connectivity options are as follows: three HDMI 2.0a ports (one with ARC, all three with HDCP 2.2), a USB port, both analog and digital audio jacks, composite-in, a tuner, Ethernet, and integrated WiFi and two 8W speakers. Overall, the TCL 55R617 Xbox One X and PS4 Pro 4K TV delivers an amazing picture quality for the price thanks to its stellar brightness, 96-zone FALD, wide color gamut, and HDR support. In addition to its combination of low input lag, quick response time, and exclusive gaming features, the TCL 55R617 is easily the best TV for gaming and movies under $1000. Now, note that the Samsung NU8000 does not have a better image quality than the R617. However, it does have a native 120Hz panel and AMD FreeSync technology, so it’s an ideal pair for Xbox One or PC as far as gaming performance is concerned. If you are looking for a TV just for PS4 Pro, go with the TCL R617 instead. Get the Samsung NU8000 only if you are willing to sacrifice image quality for the performance with Xbox One, Xbox One S, Xbox One X, and PC (particularly if you have an AMD FreeSync GPU). In comparison to the R617, the Samsung UN55NU8000 has a lower peak brightness of 800-nits as well as a lower contrast ratio of 5,500:1. Moreover, it has edge-lit local dimming as opposed to the full-array local dimming of the R617 which means that the Samsung UN55NU8000 is not as effective for dimming the parts of the image that should be darker, hence, the lower contrast. Lastly, Samsung’s TV doesn’t support Dolby Vision, only HDR10 and HLG. It does have a bit wider color gamut with 95% DCI-P3 color space covered, but that’s not nearly as noticeable as the differences in brightness and contrast. The Samsung NU8000 is one of the first TVs to feature AMD FreeSync technology. 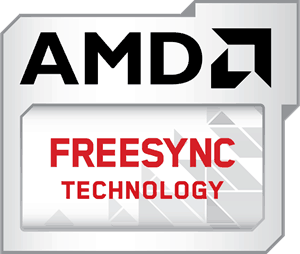 FreeSync allows the TV to change its refresh rate dynamically and in sync with the GPU of an Xbox One or a PC with an AMD FreeSync-compatible graphics card. The result is a variable refresh rate which eliminates all screen tearing and stuttering without affecting the input lag as VSync does. However, the Samsung UN55NU8000 FreeSync range is only 48-60Hz/FPS; so, if your FPS (Frames Per Second) rate drops below 48, FreeSync stops working until the frame rate is up within the dynamic range again. Moving on, the TV supports a native 120Hz refresh rate at 1080p and at 1440p which makes this TV even more appealing for PC and Xbox One S/X use. The higher the refresh rate, the lower the input lag; so, at 1080p 120Hz, the Samsung NU8000 input lag is only 10ms while at 4K 60Hz it amounts to 18ms. Moreover, 4:4:4 chroma subsampling is supported at 1080p up to 120Hz, at 1440p up to 120Hz, and at 4K up to 60Hz. At 120Hz, FreeSync range is 48-120Hz/FPS. Samsung’s Tizen OS is also user-friendly, but we did find Roku TV OS to be slightly faster and easier to use. Gaming-related features include ‘Auto Motion Plus’ for framerate interpolation and ‘LED Clear Motion’ for black frame insertion. There’s also a featured called ‘Game Motion Plus’ which can also interpolate frames but at a lower input lag penalty. The screen flickers at 240Hz while the response time speed amounts to 12ms though ‘Game Motion Plus’ gets rid of motion blur impressively well. The Samsung UN55NU8000 has nice thin bezels and an overall slim modern design. It also features two 10W speakers with solid audio quality. There are four HDMI ports (one with ARC, all three with HDCP 2.2), two USB ports, a digital audio jack, composite-in, a tuner, Ethernet, and WiFi. If you want the best gameplay performance for your Xbox One, the Samsung UN55NU8000 is the TV for you. However, keep in mind that at this price, you can get the TCL 55R617 with a considerably better image quality and a solid all-around performance as well. The newer model, Samsung 55RU8000, adds support for Google Assistant and Alexa, but has no subwoofer. Note that the 49″ NU8000 model doesn’t offer AMD FreeSync nor a native 120Hz refresh rate. 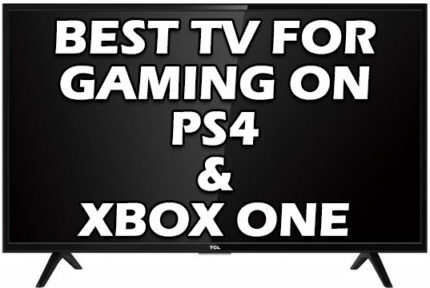 In this category, you will find the absolute best gaming TVs. These cost a little bit more but are definitely worth it if you want an outstanding gaming and movie watching experience. For spending over $1,000 on a TV, the Sony XBR55X900F should be your option to consider. It will provide you with a similar image quality to the R617, but thanks to its faster response time and a native 120Hz panel, you will get a more responsive gameplay. 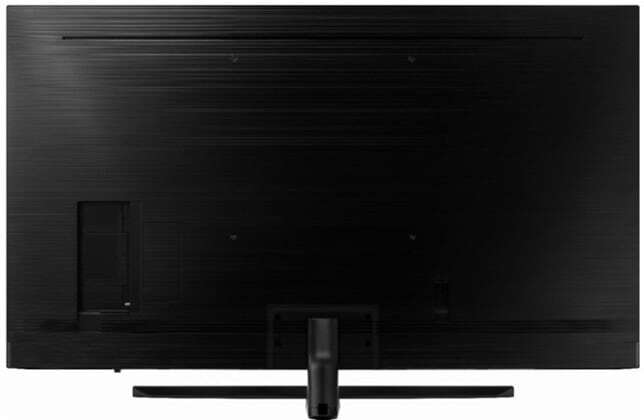 The TV has a VA panel with a 1,000-nit peak brightness for HDR content, a 6,000:1 static contrast ratio via full-array local dimming, and a wide 95% DCI-P3 color gamut. Overall, the brightness is slightly lower than that of the R617 and there are fewer dimming zones which is why we have such as a high regard for the TCL 55R617. Nevertheless, the image quality of the XBR-55X900F is stunning, you can also adjust the local dimming according to whether you prefer deeper black levels or better motion clarity. The screen surface of the Sony TV has a better anti-reflective coating than the R617 making it more suitable for well-lit rooms. Moving on, the Sony XBR-55X900F HDR TV has an exceptionally good response time performance for a VA panel display. With only 10ms pixel transition time, it’s the fastest LED TV in this list which in addition to its 720Hz backlight flicker as well as the BFI and Motion Interpolation features makes for buttery smooth fast-paced gameplay. The TV also supports a native 120Hz refresh rate at 1080p making it a great choice for Xbox One and PC gamers. Alas, the Sony XBR55X900F has the highest input lag in this list, but even with 24ms, you won’t notice any delays while gaming. At 1080p 60Hz, the input lag is a bit over 40ms which we find too high, but at 120Hz, it’s down to 13ms allowing you to fully enjoy competitive games. Based on Sony’s version of Android TV, going through the smart features is quick and easy. You also get Google Assistant as well as plenty of applications to choose from in Google Play Store. HDR support includes HDR10, Dolby Vision, and HLG. In order to enable BFI, set the ‘MotionFlow’ option to ‘Custom’ and adjust the ‘Clearness’ slider according to your preference. The TV’s legs stand out a bit, so you will need a wider table for it but other than that, the design is stylish with thin bezels and a good build quality. Connectivity includes four HDMI (HDMI-3 with ARC, all four with HDCP2.2) ports, three USB ports, both analog and digital audio jacks, composite-in, a tuner, Ethernet, and WiFi. Finally, there are two 10W speakers with DD+ support, but any dedicated sound system will provide you with a better audio quality. The Sony XBR55X900F 4K HDR gaming TV combines its striking image quality with an even better performance making it one of the best TVs for gaming. The newer model, Sony X950G is very similar to the X900F when it comes to performance and image quality. In fact, the X900F even offers a bit higher contrast ratio whereas the X950G mainly adds support for eARC (Enhanced Audio Return Channel) for Dolby Atmos and DTS:X. It also offers a better remote controller and lower input lag at 1080p 60Hz (~19ms). However, since the X950G is considerably more expensive and offers no real improvement in picture quality and performance, we recommend the X900F. If you care more about image quality than performance, go with the TCL R617 as you’ll get an equally good picture for less money – or save up for the following TV. If you want the best image quality for movies as well as the best performance for video games, we highly recommend the LG B8 OLED display. OLED displays don’t rely on backlights or dimming zones to produce the picture. Instead, they create each pixel individually which allows for an infinite contrast ratio. This means that you get deep and true blacks unmatched by any other panel technology. 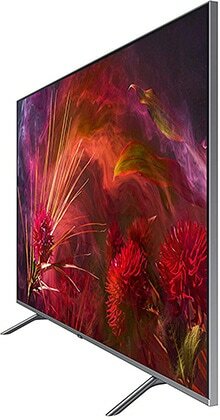 The LG OLED55B8 also features a wide 98% color gamut for rich and eye-catching colors. However, it can’t get as bright as certain LED TVs, so its peak brightness is limited to 800-nits which is still very good. Moreover, the TV has a great anti-glare treatment which makes it viable for well-lit rooms, but it’s in dark rooms where the TV shows its full potential. OLED TVs also have the widest viewing angles ensuring that the picture will remain flawless no matter the angle you’re looking at the screen. The biggest downside of OLED displays is the risk of permanent image burn-in and temporary image retention. In short, this means that if you leave a static image on an OLED TV for too long, that image could permanently burn-in and you’d always be able to see its trail. Sometimes, the burnt-in picture would fade away over time in which case it’s actually image retention that occurred. The LG OLED55B8, however, has numerous features to prevent this, such as Pixel Refresher, Screen Shift, Logo Luminance Adjustment, Screen Savers, etc. Overall, you shouldn’t worry about image burn-in as long as you mind how you use your TV. So, if you like to leave your TV on all night or use it as background noise, don’t forget to at least set a shutdown timer and make use of LG’s mentioned features. Another issue is image retention. 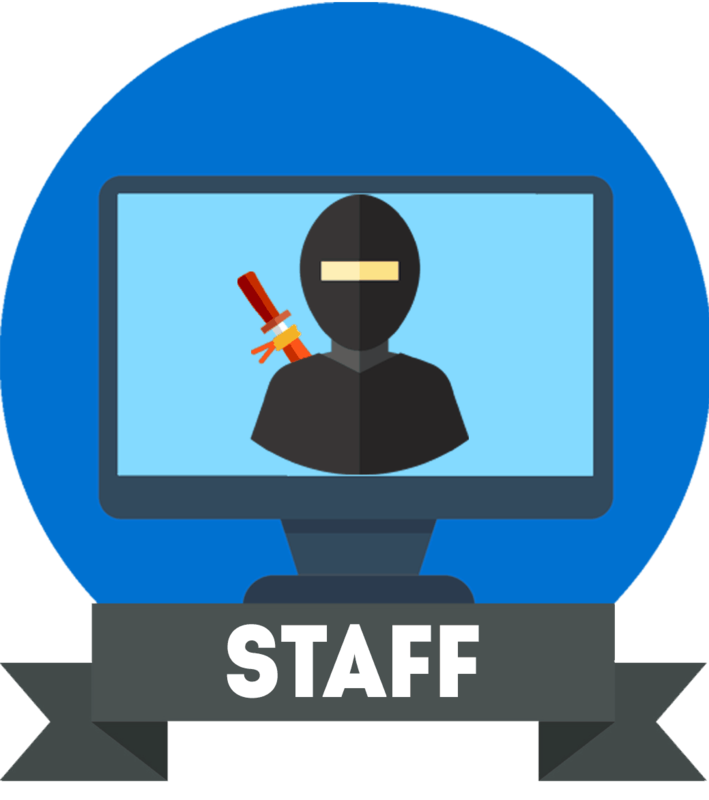 If you are watching the news or playing a video game with static elements such as banners, logos, health bars, mini-maps, etc, – those elements can also get burnt-in. However, this only happens after prolonged use of such content and it can be fixed by simply shuffling through a few channels or by refreshing/shifting/calibrating the pixels. Another aspect of OLED that is unmatched by any other panel technology is the pixel response time speed. Thanks to the rapid response time of less than 1ms, you will experience no prominent ghosting of fast moving objects and no motion blur in fast-paced games. In combination with the exceptional 21ms input lag in the Game mode, you can enjoy responsive and fluid gameplay without any issues whatsoever. Additionally, LG’s TruMotion framerate interpolation can further eliminate stutter and motion blur. For 30FPS content, use De-Judder setting, and for 60FPS content, use De-Blur. Finally, the TV also features BFI technology deemed as ‘MotionPro’ and it supports a native 120Hz refresh rate at 1080p. The LG OLED55B8 is based on LG’s webOS 4.0 which provides simple and quick navigation as well as a plenty of applications in LG’s store though not as many as in Google Play Store. Google Assistant is also supported while HDR formats include HDR10, Dolby Vision, and HLG. As you can see, the LG 55OLEDB8 4K HDR TV is extremely thin. It’s definitely an eye-catching design, but you’ll have to be extra careful with it as its’ rather fragile. Connectivity options are as follows: four HDMI ports (HDMI-2 for ARC, all four with HDCP 2.2), three USB ports, a digital audio jack, composite-in, a tuner, Ethernet, and WiFi. 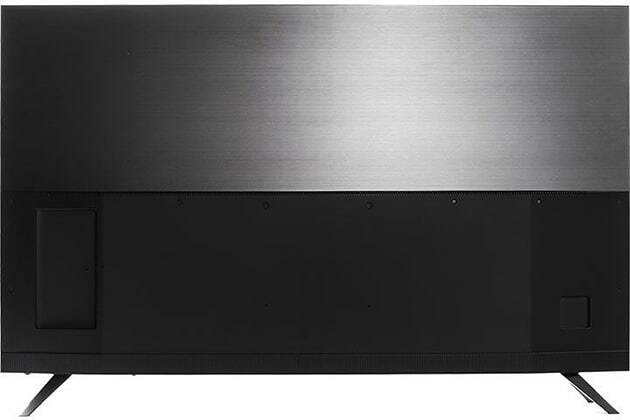 There are 10W speakers with decent audio quality as well as Dolby Atmos support. 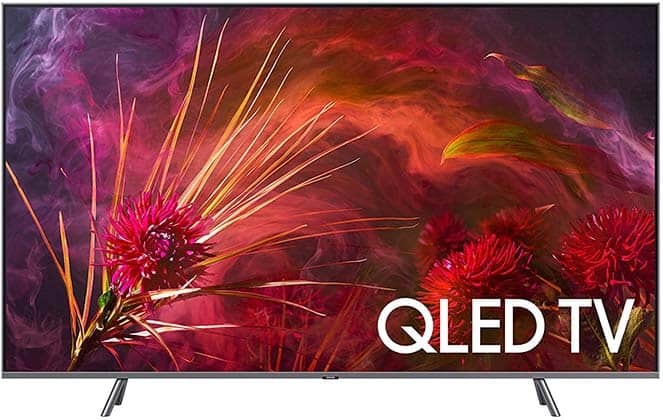 Due to the image burn-in and retention issues which are common for OLEDs, you will have to be a bit extra careful with the TV, but if you want the absolute best image quality and performance, it’s a toll you must pay. 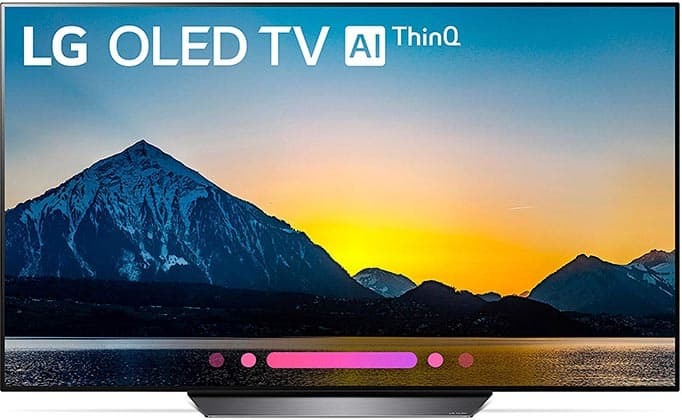 Alternatively, you may also be interested in the LG C8 model which has a newer processor, but it’s not noticeably faster nor is the image quality any better yet the LG OLED55C8 TV is more expensive; so we recommend the B8 as it has a better value/price. In case you don’t like the idea of risking permanent image burn-in and don’t want to deal with image retention, Samsung’s QLED QN55Q8F is the best alternative. ‘QLED’ stands for quantum dots which enhance the color gamut and contrast capabilities of the backlight. The Samsung QN55Q8F has exceptionally rich colors covering 99% of the DCI-P3 color space. Furthermore, it’s the brightest TV in our guide with a peak luminance of 1,300-nits. However, its contrast ratio of 8,000:1 with full-array local dimming is no match for OLED’s truly black shades, but the blacks are strikingly deep with clear details in shadows nonetheless. The viewing angles are also much worse than on OLED displays, so the picture will degrade when looked at from skewed angles, but it’s tolerable. Lastly, for the optimal image quality, calibration is necessary. In comparison to LG’s OLED display, the response time is significantly slower and amounts to 13ms. Some minor ghosting is there with fast-moving objects, but more prominently with darker pixels. The Samsung QN55Q8F input lag performance is a bit better with only 19ms of delay though it can be even further reduced to around 10ms at 1080p/120Hz or 1440p/120Hz. AMD FreeSync is supported with a 48-60Hz or 48-120Hz dynamic range which makes it this TV particularly good for Xbox One and PC gaming. The screen flickers at 480Hz and has both motion interpolation (Auto Motion Plus) and BFI (LED Clear Motion) technologies available. 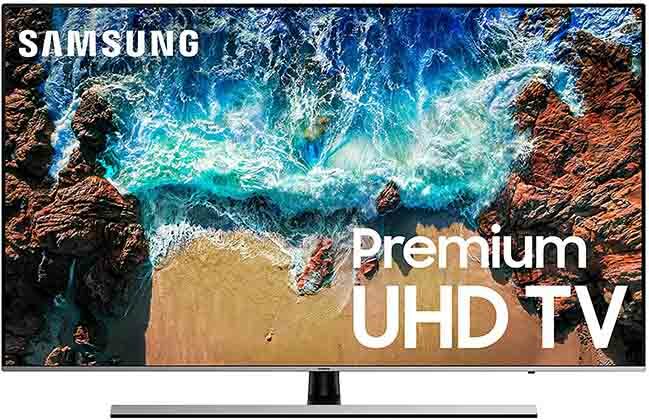 The TV features Samsung’s Tizen 4.0 OS and supports HDR10, HDR10+, and HLG but lacks Dolby Vision. The design is fairly slim though not as thin as the LG B8. Connectivity includes four HDMI ports (HDMI-4 for ARC, all four with HDCP2.2), two USB ports, a digital audio jack, a tuner, an Ethernet port, WiFi, and 10W DD+ speakers with an average audio quality. With the Samsung QN55Q8F, you won’t have to worry about image burn-in, but you won’t get as fast response time nor as high contrast ratio as the LG B8. However, you do get AMD FreeSync, a much brighter screen, a wider color gamut, and still a very good contrast ratio performance. The newer series, the Samsung Q80F, are essentially identical TVs with added support for Google Assistant and Alexa. Have you picked your next TV? Feel free to leave any questions in the comments section below. Overall, you can’t go wrong with the TCL 55R617 for the price. And if you’d like something a bit fancier, the LG OLED55B8 is definitely a first-class display. Samsung’s alternatives are also great if you want AMD FreeSync and a higher refresh rate while the TCL 55S425 will provide you with an awesome picture quality and performance even if you’re on a tight budget.